Charly Bliss Release Buffy-Inspired Video for "Scare U"
Charly Bliss understand the importance of “Doublemeat Palace,” the twelfth episode in season six of Buffy the Vampire Slayer. The episode is vital to Buffy’s character development, not as the Slayer, but as a human being who’s dealing with the real-life struggles of having to pay bills and support her adolescent sister following the death of their mother. The plot of the episode has almost nothing to do with the lyrical content of the catchy “Scare U,” but that didn’t stop Charly Bliss from using “Doublemeat Palace” as inspiration for the song’s video, which had a fitting Friday the 13th premiere at W Magazine. 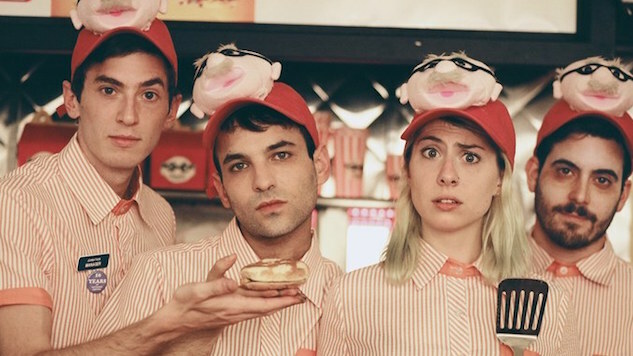 Directed by lead singer Eva Hendricks and Andrew Costa (like the other videos from the band’s debut LP Guppy), the clip follows Hendricks as she’s training at a peculiar fast food joint. Her bandmates act as suspicious co-workers that catch her investigating the questionable meat inside the burgers. Watch the spooky video for “Scare U” and a Charly Bliss performance in the Paste Studio below, and check out our Best of What’s Next feature on the band here.